An innovative, comprehensive guide - the first of its kind - to help parents understand and accept learning disabilities in their children, offering tips and strategies for successfully advocating on their behalf and helping them become their own best advocates. In Thinking Differently, David Flink, the leader of Eye to Eye - a national mentoring program for students with learning and attention issues - enlarges our understanding of the learning process and offers powerful, innovative strategies for parenting, teaching, and supporting the 20 percent of students with learning disabilities. An outstanding fighter who has helped thousands of children adapt to their specific learning issues, Flink understands the needs and experiences of these children firsthand. He, too, has dyslexia and ADHD. Focusing on how to arm students who think and learn differently with essential skills, including meta-cognition and self-advocacy, Flink offers real, hard advice, providing the tools to address specific problems they face - from building self-esteem and reconstructing the learning environment, to getting proper diagnoses and discovering their inner gifts. With his easy, hands-on "Step-by-Step Launchpad to Empowerment", parents can take immediate steps to improve their children's lives. 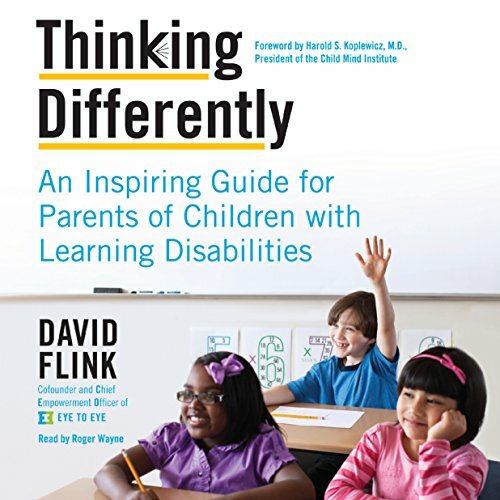 Thinking Differently is a brilliant, compassionate work, packed with essential insights and real-world applications indispensable for parents, educators, and other professional involved with children with learning disabilities. As a person who has needed to come to terms with having ADHD and LD herself, since my son has both as well. This just was exactly what I needed to listen to as I am currently questioning if my son needs an IEP in first grade. This book helped me feel stronger in my stance that he gets one. It also just confirmed so much of what I have felt so often in my life and come to a place in which I am proud of who I am and just because I need a few accommodations doesn't make me less than. thank you for this explanation. I had no idea what my son was up against and your words have brought me to an understanding. He needed my help but I didn't know how. I am now standing up for his needs and so is he. Learned so much about myself! Thank you so much for writing this book and using audible! It is a good primer for someone starting their journey with learning challenges (personal or child(ren)). It is very empowering and encouraging which is helpful because the journey for getting services can be quite tricky. Very inspiring book! Great read for parents of kids with LDs and/or ADHD. The author presents the story of "eye to eye": program to connect colleague students who have ADHD and / or LDs to school age children who have similar learning differences. It is an amazing story of children lives can be changed by advocacy and by supporting children to develop their strengths. The audio book was perfectly recommended, and does present well the emotion of the book. Worth reading too "The Dyslexic Advantage" and "No Greatness Without Goodness"; both available as audiobooks and printed books.